Your ticket includes admission to TILT - Chicago’s highest thrill ride that will forever change the way visitors see Chicago. If you want to extend your tour to day and night and observe Chicago at both times of day, choose the Sun & Stars option, good for two visits. With your admission to the 360 Chicago (John Hancock Observatory), step off Michigan Avenue and into a high-powered elevator that will take you on an exhilarating ride to the 94th floor at a speed of 20.5 mph (33 kph). The observatory provides unbeatable views of Chicago at all times of the day: Go in the morning or afternoon to admire the expansive blue of Lake Michigan, go at sunset for a romantic moment, or go at night when the city becomes a sea of twinkling lights. More than just the tip of a tall building, the 360 Chicago (John Hancock Observatory) offers several activities to complement the pretty view. Explore Chicago through the best technologies such as interactive screens that allow you to zoom in and out of famous locations across the city and test your knowledge on digital challenges. The guide is available in five languages as well a version with commentary designed for kids. Your admission ticket also includes TILT - the first thrill ride of its kind in the world. 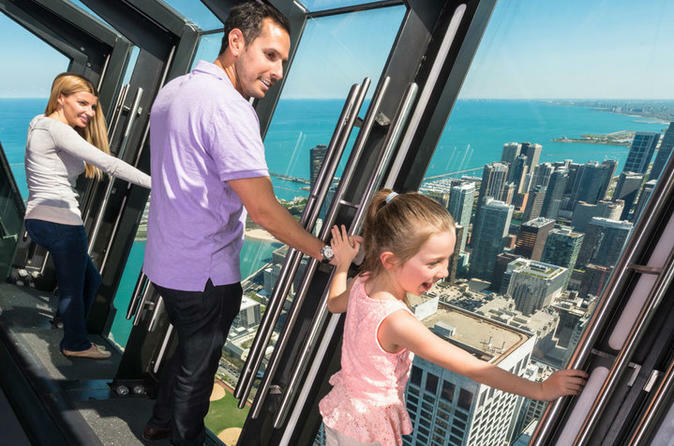 TILT extends out and over The Magnificent Mile® and Chicago's famous skyline, offering visitors unique, downward facing views from over 1,000 feet up.TILT safely holds up to 8 visitors at a time. If you need to catch your breath, head to the observatory’s BAR 94, where you can take a break with an Italian coffees, gelato, cocktails, or the delicious café menu.